It’s no secret that we tend to like Moto Guzzi motorcycles here at MD. Their quirks and idiosyncrasies, most often, only add to their charm. Since the legendary marque was purchased by the conglomerate Piaggio in late 2004, technical improvements and refinements have been made to engines that were largely unchanged for decades. 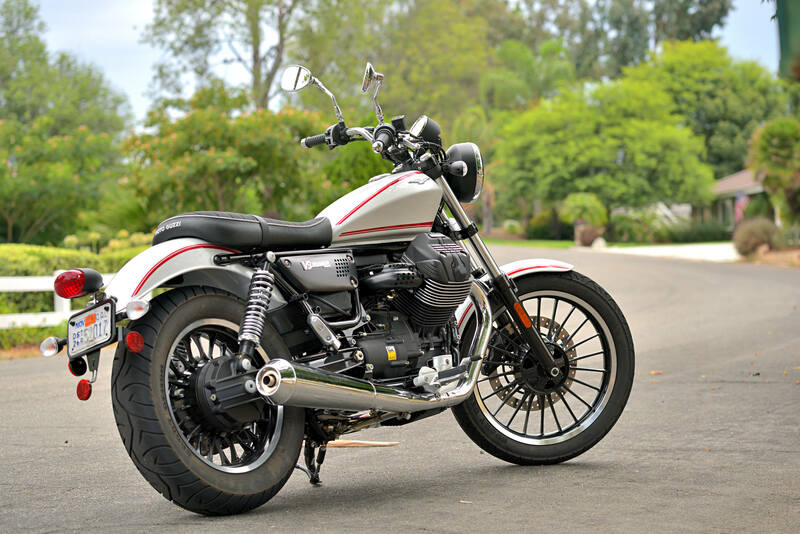 In the Fall of 2015, Moto Guzzi announced new V9 models, including the Roamer and Bobber. The Bobber is a model reflecting its name, i.e., with the same engine and chassis as the Roamer, but with fatter tires and a smaller diameter front wheel. We just got our hands on a V9 Roamer for a test here on familiar roads. This is an interesting motorcycle for a number of reasons. With a 19″ front wheel and 16″ rear, it has a moderately raked look, but actually corners quite confidently. The tank shape is new, and unlike the tank on the V7 models whose engine formed a starting point for the V9’s 850cc, 90° twin. We discussed the V9 Roamer in an earlier article, and we will save a more technical discussion until we do a thorough evaluation of the bike and report back. 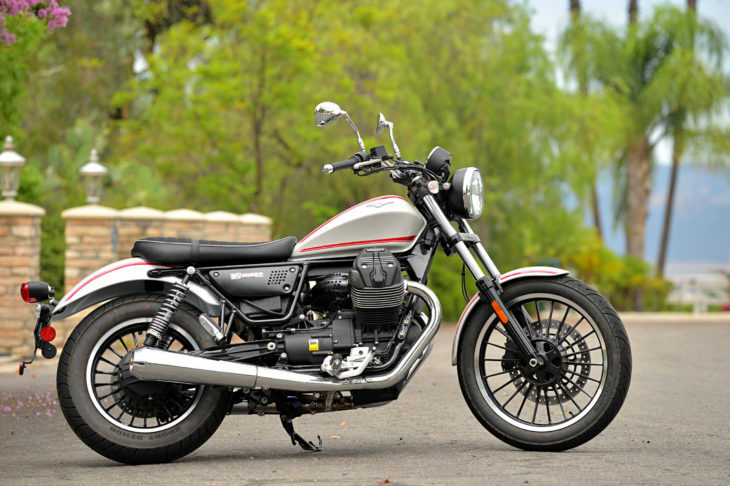 Nevertheless, we should point out that Moto Guzzi claims a modest 55 hp at 6,250 rpm and 45.7 foot/pounds of torque at 3,000 rpm from the 850 cc unit, which utilizes shaft drive and a six-speed transmission to deliver power to the rear wheel. Our first few rides on the bike reveal an extremely torquey power delivery, i.e., strong pull just off idle that signs off quickly, just as the claimed power figures suggest. This bike won’t be winning many drag races, but it is still satisfyingly strong at street rpm levels. This is helped by a relatively low curb weight (Moto Guzzi claims 439 pounds wet). Styling is a subjective matter, but we like the look of the V9 Roamer and others who have seen the bike seem to agree. This is a Moto Guzzi that reflects the refinement of this basic engine and chassis by the Piaggio Group over the last decade, principally in connection with the V7 series. U.S. MSRP is $9,990. Stay tuned for additional reports. I’ve said it before and I will say it again. Those cylinders sticking out in front of God and everybody scream motor/cycle, and it is good. This one in particular, blah. Here is the pinnacle. It doesn’t matter what you ride ! Just show some respect to each other’s comments. By the way this Guzzi is a class act. A Harley Sportster makes 73 lb-ft of torque. The Bobber makes 46. For those of you that enjoy arguing the merits of limited power, what’s your lower limit? 40? 35? 10? I own a Moto Guzzi Stelvio, and the case can be made that while its 100 horsepower is down significantly from its competitors, 100 HP is more than enough. The Bobber makes 51 HP at the wheel. I’m sure it’s fine for a solo rider that enjoys the scenery, but not sure why there’s so much animosity directed toward those of us that find a strong surge of acceleration exhilarating. I also own a ZX10 and can assure the elitists among you that I can ride it very, very well. And while I agree that it’s dramatic overkill for the street, it’s still a lot of fun. And that’s pretty much the point, isn’t it? The Sportster is only producing half as much torque at the crank as an average person pedaling a bicycle. Big deal. Lol all these bicycle analogies. This isn’t bicycle daily. I do believe it only takes 15 hp to out accelerate and out run a bicycle. Probably less… And with a lot less effort too. I gave up bicycling long ago because of all the effort even though I could produce 120 lb-ft of torque at the crank. now the only torque I need is in my wrist on the throttle. Per circumstance, my daily driver is a Mazda 2. An old one (not sold in America). It has 1340cc and will either accelerate (slowly) or go uphill, but not both at the same time. Most cars over 2 liters in capacity will do both, however slowly. My Suzuki DR650 derived Freewind sits in my shed because our evil NZ government demands far too much money to legally ride a motorcycle. Again, this is fast enough for my needs, should I ever be able to afford getting it back on the road. The Suzuki’s performance advantage is in handling, which is superb. If a vehicle is a pure pleasure to ride (or drive) over distance, this makes engine performance immaterial. If you don’t have to slow down, you don’t have to speed up as much, therefore less power is OK. This is the philosophy followed by Moto Guzzi. They specialize in high torque Vee Twins and good handling. A good rider needs nothing more for riding pleasure. A high power sports bike may have tons of power, but eventually you either have to slow down or die. I prefer the more consistent and less tiring pace provided by a torquey motor with fine handling. Had I the money, a V7 would be in my shed. God, That is a beautiful bike. Looking forward for the test result! I remember years ago being in a multi-brand dealership. There were two guys looking at the then new Ducati 996. Power is all relative to the user’s expectations; period. None of my bikes make over 85ish Hp. My V11 maybe high 70’s if the magazine reports from 15 yrs ago are to be believed. I have had a tepid response to the V7s, and was a bit disappointed by the V9. My first thought was would Guzzitech’s in house designed 4V heads fit?? Since I own a guzzi, I am someone who would buy a Guzzi vs just say so without ever completing a deal. The brand should be concerned that their current products, 1400 cruisers and overpriced starter bikes, are not making me figure out how to get one in my garage. Well stated. There is nothing wrong with useable power. Excess power that is without purpose save that of salving the owner’s ego is without merit on the roads. Guzzis, like Harleys, are made for the real world. Too bad so many bench racers live in the Matrix of their ego fueled minds. Again, well stated. And yes, there are plenty of motorcycles made by other manufacturers that are well suited to the real world. In fact, just about all bikes are. Some riders however, leave much to be desired. Cruisers like Harleys and Guzzis remind me of my ’67 SS396 Chevelle. Looks great. Makes great noise. In its day it was considered fast, but it handles and stops like a truck. So go on and tell me my ZX-14r only salves my ego-fueled mind. I’ll tell you that in a panic situation, I can outperform your two-wheeled couch in handling and stopping to avoid a crash you cannot. I’m constantly amused by guys that modify their cruiser so it sounds powerful and fast, only to mock cycles that actually are powerful and fast. I don’t use all 200 HP, but you don’t use all you have, either. The difference is, I have handling and braking you’ve never dreamed of. I’ve never used all of those either, but if and when crunch-time comes, I have them and you do not. +1. Shiny side up, brother, and don’t spare the horses. The bike needs a minimum 5 gallon tank. It needs triple disc brakes to go with the ABS. It needs a centerstand too. What it doesn’t need is excess horsepower that adds to the ego of the wussified of the Internet Matrix and takes away from the mpg needed in the real world. Did you see the word “excess”? Look it up, kiddies. Too much of a supposedly good thing is bad in the real world. Guzzis are about longevity, style, class and history. Their own history, not a stolen one like so many Japanese “cruisers”. And yes, speaking of longevity, we all know Guzzi has been going out of business since it’s inception but quality control is up and they just need to find a bigger niche. I doubt their bikes cost a ton to make but given economy of scale the Japanese and the 5th world manufacturers have them by the testicles. The V7 is a fine bike missing only an additional front disc brake and a centerstand. Power is adequate for any save those with a priapic ego. Age has nothing to do with ego. There are plenty of older riders that are just as ridiculous as any of us can be. Some here feel that horsepower translates to them in some mystical, magical way and in doing so makes them “cool”. Or in the words of what passes for people these days, “phat”. Stupid. “I neeeeeeeeeeeed it to stay safe on the highways!” Right. Guzzi makes great bikes and when they make one that does what I need, then I will buy one. Until then, my current bikes are paid for and work just fine. I don’t have disposable income. Never have. Few people do and those that I know personally that do have money like that have gone without a lot of things to get to that point in their lives. None of them ride motorcycles. That last sentence sounds like a lot of people here. Why would it need an additional brake disk? It doesn’t go fast enough to be able to fade a single brake disc, I wouldn’t think. Certainly not when used in the intended manner. Why do people even bother to respond to this azzhat’s stupid rants. ??? Actually, we don’t give a collective shite about what you think, but go ahead, ramble onward if it makes you feel better. You responded, so obviously you have the answer. Can you enlighten the rest of us? It wasn’t a response to his statements, merely a comment about him. How old are you 100? The proverbial ” get off my lawn” poster. So you get to decide now much HP is enough for everyone? DId not know that. Are you really this much of a simpleton? Apparently so because your read as such. “Get off my lawn”. How plebian. You know exactly what I mean but are too lost in trying to appear “cool”. You may want more than adequate but you are far from up to handling it. Especially on public roads. Of course you are sooooo bitchin’ that you can do whatever you want on the roads. Take it to the track where when you crash you harm only yourself. Unless you run into other of your ilk. Pathetic imitation of lifers. You’re the reason tiered licensing should be done in the USA but by IQ. Then such as you would be confined to a 50cc noped. Run along, your mums calling you. This would be hilarious if it wasn’t so downright obtuse. Yeah, guy, you pegged him just right. mickey, our Sixty-Something-Years Old Scourge Of The Public Highways And Byways, just killin’ fools at the track on his bone-stock CB1100! Watch out, yo, mickey is back in town, and he’s gunnin’ for your daughters! That my friends, may be one of THE best comebacks I’ve ever seen on the MD. Long stroke engines with a broad torque band are much better for everyday riding around town or long distance. That is why Harley has been so successful. Short stroke high rpm engines with torque that peaks at 7000 rpm and horsepower that peaks at 12,000 rpm are good for canyon carving or track days but are not so practical for everyday riding. That’s why sport bikes are losing marketshare, not the least reason being their uncomfortable rider triangle which is only good for racing. People forget that you can ride a bike below it’s peak any time you want. It’s ironic that running most cruisers around close to flat out is just considered cruising for most sport bikes. A 100 hp bike puts out 50 hp much easier than a 50 hp bike does. BTW, I could care less how much power my bikes make, I only care about how much I enjoy riding them. Running a 100hp+ engines at 20hp all time time is what leads to many motorcycle’s poor fuel mileage. Sacrifices & compromises..
My 100 hp Yamaha YZF600R gets the best fuel mileage of any motorcycle over 500 cc I’ve ever owned. Ridiculous, run at 20% output and they will get better mileage. When you open the throttle the burn goes up and mpg goes down. The relative physics are the same with a 55 horse motor. No, it isn’t. Fixed timing engines will inherently have a optimum efficiency. In the case of a high performance engine, this is naturally going to be at higher rpm and power settings (throttle openings). At lower power, they suffer. Badly. How does a 105hp 600cc SS bike struggle to get 38mph and a 45hp Honda NC700x easily gets 65+ mpg? Slipjoint, that is incorrect. It is very inefficient to run an engine with small throttle openings. There are at least three problems: 1. the pistons are still trying to pump the same amount of air regardless of where you have the throttle. It is much easier to pump air when there is no restriction i.e. the throttle is wide open. 2. when there is a small amount of fuel/air inside the cylinder it doesn’t mix well and it doesn’t get compressed very much. Engines burn more efficiently the higher you increase the cylinder pressures and the more completely you fill them. Think Diesel engines which don’t have throttles and run very high compression. 3. air flow creates harmonics. Look at a dyno chart and you will see that a torque curve (efficiency) has a peak. At some rpm the flow and volume fill is much greater than others even though the cylinders remain the same size and the throttle stays at the same aperature. It is most efficient to run an engine at WOT at the peak torque rpm. On some engines (like Harleys and the NC700) this is very close to cruising speed where wind resistance is low. On some engines this is at a much higher speed and wind resistance negates any increase in efficiency. The Moto Guzzi 850 engine in the article is oversquare. Besides Harley Davidsons what motorcycle powerplants are you talking about? I can only think of a single example and that is the Honda NC700X—a design made expressly to produce high MPG figures. I guess the Indian engine is slightly undersquare but that is only because they are emulating HD. The reason HD retains an undersquare design is because they are stuck with it. What displacement would they be if they used a short stroke or square design? They must have a long stroke to reach the engine size they need. The 45° cylinder angle limits bore diameter. HD zealots use convoluted logic to praise their brand. Guzzi seems to putter along just fine. If that’s enough for Piaggio is another story. They have killed off the 1200’s I think, due to minuscule sales, and rumor has it they might introduce something besides an air cooled transverse mounted V twin. That design is too limited. It works for giant cruisers and they have a bit of that space. These Sunday driver small models are never going to sell a lot. A break the Guzzi mold design is a risk they might take so they can really compete in other segments. I mean I heard they sold a total worldwide of 7000 Stelvios, since what, 09, cripes. Just to help add fun to the argument. The 3-5 dyno reports published by the usual offenders all seem to have the v9 putting 50-51hp to the tarmac, That’s pretty good for a bike rated at 55hp by the mfg. Really, that’s a “new” model? They didn’t just find an old warehouse full of 70’s era bikes that they forgot to sell? Or did I miss that in the article? Why is 7 out of 10 Moto Guzzi’s so stinking ugly? Norge-nice, V7-hot rod (good), LeMans, classic. V9 Roamer-Fugley. I don’t get the “more power needed” comments. My V7 will cruise at higher than legal speeds all day. It has been on several multi day trips, with zero issues. It is as easy to work on as any motorcycle I have ever owned, easy to move around in the garage, what is not to like? Funny thing about horsepower. Each individual determines how much they need. There is no right answer for how much HP is enough. Just read a story about a guy that traveled from Cali to New York on a CBR250. He would probably tell you he had all the power he needed. NO WAY would I consider a CBR250 ( what around 30 hp?) adequate enough to ride across the country on, even though it will obviously do it. Heard a story today about a guy that rode a Grom from Cali to NC to join up with a group of Grom enthusiaists on the Dragon. NO WAY would I consider a Grom ( what 16 hp?) adequate for traveling across the country, even though it can obviously be done.. Same goes for a Roamer.. 49 hp may he enough for some, but not near enough for others. The best that can be said is, this bike has enough horsepower for ME, and that’s all that matters. People typically do not use much of the available power in a motorcycle, even when they have the throttle wide open they might be at an rpm (or in a gear) that does not allow the amount of throttle being applied to offer much power. It only takes about 15hp to accelerate up to and maintain 75 mph – enough to beat traffic and be considered speeding. Sure you can use more power for exhilaration and getting your kicks. But having enough to do something does mean it is adequate to do it. According to the dyno it my ST1300 travelling 75 mph is using a little over 60 hp. I doubt 15 hp would get it up my driveway. I guess your ST is an inefficient machine! I had a 40hp VW Beetle (one of many VWs…) and it would do about 75 mph. I also have a 90cc Yamaha with a smidge over 10hp. With a slight tuck, I can see 75 mph. Usually dyno runs are WOT as it climbs through the revs. It’s not often you run a dyno at a steady state cruise rpm. It can easily take lots of power to get to 75 mph, depending on how quickly you want to get there, but once you reach a speed it takes significantly less power to maintain it. I think there is something wrong with your dyno, your bike, or the way you’re interpreting the results. I imagine your 40 hp beetle and 10 hp Yamaha were wot at 75 and had absoluetly nothing in reserve for say passing or climbing a hill. Doubt you were accomodating passengers and luggage. There are legitimate reasons for wanting, needing more hp. Nothing wrong with my bikes, they are extremely capable of transporting me anywhere I want to go in this country at any spped limit posted with some power in reserve for safety reasons. Yes, the point was that your ST is not using 60 hp to run 75 mph. That is reduculous and, if correct, something is terribly wrong. I have some experience here. From 2004 through 2016 I rode a (2 actually) Kawasaki ZZR 1200. Typically 140RWHP was reported for this model. Not liter sports bike of this age pushing 180 or more so let’s call it stupid fast. Faster than a Blackbird. It was real world fast too. I mean really fast. 100 was absolutely nothing, a piece of cake at any moment. I now own a 2013 Stelvio. 95RWHP? It is plenty fast enough. Still………….. There is no substitution for that rush of a high RPM modern motor with honking intake and a speedometer that just sweeps to the right so fast. I miss it but 400 or 600 mile days are so much nicer on the Guzzi. Then again, on the interstates and suburban freeways, full combat mile eating across portions of states, that ZZR was perfect. Merely being able to cruise at higher than legal speeds means next-to-nothing for someone who rides motorcycles for reasons extending beyond the quest for a sedate, relaxing, slow-motion sightseeing tour. Well, sure. Agreed. The thing is, there is a vast world of bikes that exist between the turd-slow 45hp cruiser realm and those modern supersport literbikes. Within that vast world of motorcycles can be found countless bikes with superior comfort, braking, and handling, and they also have enough power to allow the rider to putt around and simply enjoy the scenery OR rip around and scratch that need-for-adrenaline itch. The other misnomer people bandy about when discussing super-slow bikes is this “very torquey motor” thing, including the ubiquitous “wide spread of torque below its torque peak.” Look, people, it’s not very torquey at all. It makes very little HP or torque. It just happens to deliver what little torque it does make very low in its very stunted powerband. The numbers don’t lie. Forty-ish foot-lbs of torque pushing a heavy motorcycle is still only forty-ish foot-lbs of torque pushing a heavy motorcycle, no matter where in the rpm-range it’s pushing it. Slow is slow, and prematurely running out of steam doesn’t change the fact that it offered very little steam to begin with. Sometimes—oftentimes—people simply want more. They can always roll off the throttle when they want to do the parade thing. That’s lot of text to basically tell loraz that you think his bike is “turd-slow”. Well, it is, but that was hardly all I said. Funny thing is, I like Guzzis. I keep trying to own one. I was all fired up to grab a V7 a couple of years ago, but the test ride quickly disabused me of that notion. Next was the Griso 8V, which looks so damn cool, but the seating position didn’t work for me. I still want a Guzzi. I’m just not at the point yet that I could be satisfied with the V7’s lack of power. Perhaps in another ten years or so? The Moto Guzzi V7 does 0-60mph in 5.3 seconds and does the quarter mile in the 14s. That’s about the same as a 2016 BMW 328i xDrive. The V9 is faster than that. And since when is 439 pounds wet weight a “heavy motorcycle”? You need some perspective. The original T120 Triumph Bonneville made 46hp. The BMW R 75/5 made 50hp. A Yamaha RD350 two stroke made 39hp. It’s not this bike. It’s you. Fred just because they were the best thing available THEN, doesn’t mean they are or will forever be the best thing to do the job. Shovels do a decent job of digging holes, and at one time that is all man had, ( sure beat digging with your hands or a pointed stick too), but backhoes dig holes a lot better and a lot faster today. I’m betting Persig would choose a much different motorcycle than a 28 hp twin if he were to travel from Minnesota to California today. I know I would. That is dog-slow for a modern motorcycle—comically slow, actually, particularly for such a relatively light 750cc motorcycle with semi-sporting pretensions. Hint: When discussing motorcycles, you don’t advance your argument by comparing their meager performance to that of a conventional passenger car. I was referring to the gaggle of 45hp cruisers listed above, most of which are extremely portly. Yes, and by today’s standards, those bikes are dog-slow. By today’s standards, a current T120 Bonneville is overweight, underpowered, and dog-slow. Numbers don’t lie. You are aware, aren’t you, that you’re not the only old guy here, right, and that nearly everyone here is well aware of Pirsig’s tome? Oh, I know I’m slow. I can’t even manage one horsepower. But my bike isn’t slow, while the V9, V7, and all the other bikes you’ve mentioned are decidely slow by modern standards. I’m sorry this news seems to bother you, but it’s a basic fact. The fact that you are comparing it to antiques to offer “perspective” is pretty telling. I might use that exact same comparison to make the counter point to your argument. The bike is too slow. The perspective you offer is that we speak different languages. And anyone speaking the same language that I do knows good and well… It’s not me, it’s this boat anchor of a bike. Oh it does matter very much at what RPM your torque is being made. If your torque is at 60 rpm you can only accelerate as quickly as a bicycle. If you’re torque is spinning 100,000 that’s enough to power a helicopter full of troops. The same can be said for a Corolla. It works for you. I know from experience with several bikes in the 35 – 60 HP range that I’d become dissatisfied with the V7’s inability to pass at will on mountain roads, and not being able to effortlessly maintain my desired cruising speed on long grades and against headwinds. Somewhere around 55-60 HP in a fairly light bike these issues have become non-issues. I also ride a plated XR250R and with all of 20 hP I have to be in a completely different mind set then on a street bike – I regularly have to pull over to let car drivers pass me on mountain roads! I’m in the “it’s OK but wished it had the V7 styling/wheels” camp. The V7 is on the wrong side of “my” power limit, this is on the OK side in that respect. If it had a 17″ rear and standard seating/pegs I’d be much more interested. So, I’d say Triumph with it’s T120 (or a Ducati Scrambler) would be ahead of this Roamer. After buying and riding over a dozen Japanese motorcycles over the last 50 years I recently purchased a ’05 Guzzi 750 Classic. While the cruizer-ish styling is not what I would consider optimal, I can report that the bike rides and handles like a dream. Not as powerful as some of my old bikes (Suzuki GSX1100F for example), but still strong enough to keep me feeling relatively safe on congested high-speed expressways. At 67 years old I have dialed back my ‘need for speed’, but still enjoy the rush of the 750’s ample torque curve. Driving / commuting around town has never been more enjoyable. Good on you MG. That’s a beauty, inside and out. I hope that you and Triumph continue to sell lots of these bikes. Where’s the beak? Get rid of that seat and give me a vice-grip butte-high solo and a 3 feet long license plate stalk. It looks like the seat would need to be another 3-4 inches longer to accommodate a passenger anyway, so it’s just another bike that I won’t buy, no matter how nice it looks. Torque is available just off idle, but power drops off above 6,250 rpm. Why is this a bad thing? Why does every motorcycle, no matter the target audience, have to be judged by sport bike standards? Why is relaxed cruising — and by extension, riders who enjoy this type of riding –judged by motojournalists to be inferior to high-speed, high-rpm blasting? Different strokes for different folks. Amen. I find that it’s more often the commenters than the motorcycle journalists, though. Agree, Kev. In reality most people just putt around with significant other. It’s good to have power on tap, but not everyone is a hooligan riding on the rear wheel at 110. My first “big” bike was a Honda 919. Even with around 100hp and 60lb/ft, it was still considered slightly underpowered compared to its contemporaries (FZ1, ZRX, etc). I found it to be just about the perfect amount of power for the kind of riding I did (commuting, light sport touring, and two-up rides with the wife). So these numbers are the benchmark for me when considering a new bike. While I don’t expect modern supersport levels of power from a retro standard, I do know that I want more power than this Guzzi has to offer. I’ve ridden bikes with this level of power before and found them to be a bit tepid. Fun and stylish for a quick squirt around town, no doubt, but my riding is not limited to that. When I finally manned up and bought my R75/5 I felt it was a bit overkill for the kind of riding I did (commuting, light sport touring, and two-up rides with the wife). When I later stepped up to the 74hp 650 Seca I thought it was ridiculous excess. Having owned and ridden a number of “bigger” and “badder” (more powerful) bikes since I still come back to those bikes in the garage, take them out for a ride, and continue to feel the same way. How come you are not coming back to a 90cc Yamaha in the garage since it apparently has enough power. There must be some reason you went from a 10 hp bike which would run 75 mph to 60 and 74 hp bikes? I did ride the 90 to Just outside Tahoe from the San Francisco area using all side roads and some freeway. I averaged 125 mpg, pretty good for a two-stroke twin but not as good as the 150 mpg the owners manual claims. I bought the R75/R because it was beautiful and very comfortable. The Seca was free and is extremely reliable, unlike my GB500 – which is also more than adequate at 34hp. Ive bought and sold numerous other bikes since ultimately settling with my K75S. It’s also no “powerhouse” but is way more than adequate and pulls harder than a ZX11 in top gear on the highway (all because of gearing, not overall power). I got the K because it is very nice looking, unbelievably reliable and maintenance free, and has bags big enough to fit my laptop for work. I agree that many people look at horsepower as an absolute and make their judgements on what is and isn’t a good bike based on that. I’m not that extreme, but how much power a bike makes is important to me and makes quite an impact on how much i enjoy a bike. I can always go slow on a powerful bike, but I can’t go fast on a slow one. I know this Guzzi will never float my boat. But taken for what it is on its own merits, it is a nice offering in the niche of the maket it competes in.. I really like Guzzis in principle and years ago I owned a couple but the current line up leaves me cold. They don’t have anything recent that is more practical than stylish. A mini-Norge with maybe 75hp for <$12k might get my dollars. It’s a nice enough bike I guess, but I wish they would’ve just graduated the V7 style up to the V9. I prefer the V7 style. It harkens back to the 70s and 80s LeMans bikes for me, and (in my brain) it would make more sense to stay with that history rather than relegate the V9 to these cliché models. The V7 is a perfect entry level bike, and when you’re ready for something bigger…you step up to the V9. Makes perfect sense to me, but alas, I don’t work in MC marketing. This bike doesn’t quite come together for me. I rode a Breva 1100 once and totally loved it, so I like Guzzi. I’ve read that next year’s Euro 4 regs mean new engine designs, which probably means water cooling. That’ll be a good thing. I have a Breva 1100 and love it. Slip on helped a hole in the midrange. I ride it more than my Sprint 1050 (which is both faster and smoother). The Breva is super comfortable, great handling bike. Great brakes. As much as I like Guzzi, I cannot get along with my local Guzzi wrench. Truth be told, I backed out of a new motorcycle purchase deal a few years ago and he didn’t like it. So I don’t buy them any more. But I’d like to. Sounds like you did the right thing. You vote with your dollars. drool. This is how you appeal to all customer segments. I believe this model’s engine is not derived from V7 but is completely new. Specifically, it does not carry ‘small block’ engine’s Heron’s combustion space but uses conventional pent-roof. The V7III also received the new heads. The block, 6-speed transmission are all borrowed et al from the V7. Moto Guzzis are a little too quirky for my taste, and their dealer network is pitiful in the midwest. Not sure about other parts of the country. This particular Guzzi looks ok, but isn’t a Guzzi model I would consider. Like the looks of the Norge more, or the V7 Classic. I’m in the midwest (MN), and we’ve got a few dealers around here. One of them actually stocks some regular service items – they had gasktes for my old V11 LeMans, no ordering necessary! Even Watertown, SD has one! Sure, they’re not on every corner in rural towns that would sell ATVs and such to farmers, but they’re not completely nonexistent, either. Yes, obviously keeping some prospective sales away. I’m fortunate to live within an hour of my closest dealer. Only had them do the first maintenance @ 600 miles, it hasn’t been back since. Now I’ve dropped by a time or two just to say hi and have a look around (also an Aprilia dealer). If I had some serious service needs, the proximity of them would be much more important. I guess it’s a trade-off I was willing to take. Yes, I love Moto Guzzis. I’ve owned a Stelvio, 8V Griso, four of the various 1100 California models, a V7 Stone, and now a Roamer for the last 1500 miles. Until I got the Roamer, the V7 was my favorite among all those. Too early to say, but by the time it’s said and done, this V9 may be the pick of the litter. It’s just a wonderful all around motorcycle. I had to change the pegs to the standard position as the forward American location was not to my back’s liking, but since then it’s been smiles and miles. It does look tons better than a Sportster. Not as good looking as a Storz 883 but that doesn’t count. I’m happy with my Road King, but this is a bike I’d buy. I think the power is totally fine for a cruiser with single front disc but I wish it had wire wheels. Wake me when the Indian Scout motor makes 10-20% more power and is stuffed in a standard chassis that cooks with gas like the motor………. An handful of internet posters does not make a business model. If there were a robust customer demographic, they’d know it, and chase it. I’ve never heard them ask. I think the primary problem with companies like Harley and Indian is they build what their customers want. The companies that are growing are building what people who are not yet their customer want – or at least trying to. It makes no sense preaching to the choir if you want to grow your flock. Once it is converted for street use it will also be a thousand pound whale (and called a Scout 45). I’ve seen both V9 in real life but still like the V7 and the V7iii with the same valve configuration makes the v7 even more attractive. Make a Griso with that engine, or a miniNorge and we’re getting somewhere. I own a Moto Guzzi V7, 2015. I have owned a lot of Motorcycles. I own 5 right now. Including a 1250 Suzuki Bandit. The V7 has lots of low end torque. Is really smooth at highway speeds. Can be ridden fast on a twisty road, and just leave it in 3rd gear. It gets 55mpg, with its 5.3 gallon tank. It is really light for it’s class. For a general do all motorcycle, it is good. If all you want to do is go for a ride, you don’t need super top speed. The air cooled Guzzis are easy to work on, and low maintenance. Thanks Blaine, always good to hear from someone who has lived with the critters. 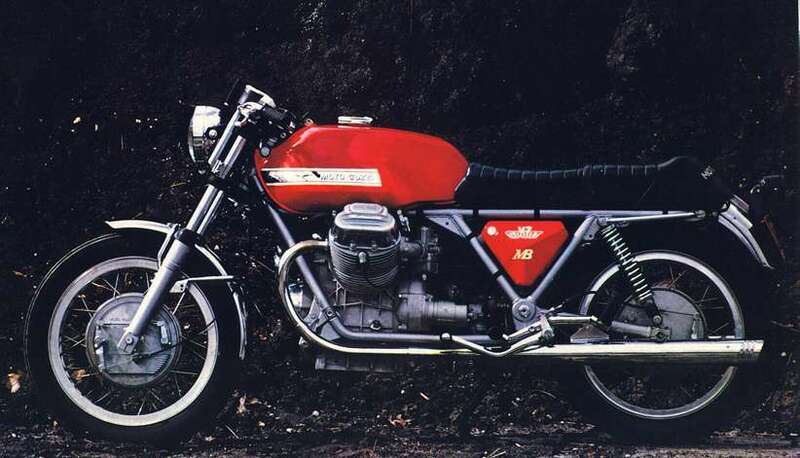 Always wanted a Guzzi–will probably end up with an XT 250 in a year or so…just to putter around on. Lived with my 750 Guzzi for 13 years and its been a great bike. Its done touring over a weekend or a week, taken me to work and back in all weathers, and is fun to ride and put a smile on your face. The cognoscenti really appreciate the small block Guzzis, they are machines for life. Most of the problems (minor..to do with finish and battery capacity) can be solved by storing your bike in a garage, looking after the battery, and getting a new one where standards of finish are far higher than they were in 2004. Hey, you boys play nice. I think it looks like a fine machine. Nice mix of retro (seat, pipes) and unique ( tank, wheels) I would ride it. I have noticed many bikes look OK at best in pictures, but in person they can be much more appealing. But I will admit, I love all things moto. Price seems fair. It actually reminds me of a “beefed up” Yamaha XS 650,they sold them forever and still have quite a cult following.I like it but $10K for a light commuter/around towner is a steep buy-in. Or you could ride it across the country? Guzzis are made for touring. All of them. I’ve owned one Guzzi, a 2006 1100 Breva. Comfy saddle and decent brakes and handling but the electric gremlins and constant seeping from the CARC led to it being traded for something less troublesome. Hopefully these newer models are easier to live with. I don’t get it. It’s kind of ugly and has very little power. If it was ugly but fast…okay. If it was slow but looked great (hello, V7)…okay. But it’s ugly and slow. Who’d buy it? And what were they drinking at the time? Who’d buy it? Someone who liked the styling and wanted a relaxed power band rather than high horsepower. If the target audience is a senior citizen buying his last motorcycle, that makes sense. But if the target audience is new riders, why would they choose the V9 over a V7, which looks better and costs less? New riders also have an assortment of lower-cost Japanese models to choose from. But they ain’t Guzzis. Now whats that saying….”if I had to explain it to you wouldn’t understand”. The target audience is neither senior citizens nor the under 21 beginner crowd. This is aimed at new and returning riders who are further along in life, where the price is not a big issue. The V7 looks better to you and the V9 looks better to other people. To each his own. Do not forget, this model is geared toward American rider’s taste; at least by my own marketing’s perception. I’d be very surprised if Euros like it, unless they are self-imposed wanna-be-Americanos. You would be half right – we like the mechanics but the aesthetics are a bit Marmite. Give us a V7 styled V9 with 65 hp we’d be flat out like a lizard drinkin’ buying em. I like this. A lot. But danged if I know where there is a Guzzi dealer anywhere near me. Not only have they managed to “not” match the power output of comparable engines from decades ago, but they are actually even lower. Until they can manage to “significantly” raise the power figures of both this bike, as well as their V7, I’m simply am not interested. “Character” is fine and all, but at the end of the day I need some power to go along with it. I see no reason why Moto Guzzi can’t offer both in these new bikes. What’s your definition of a “comparable engine”? The 853cc Moto Guzzi V9, 883cc Harley Sportster, 942cc, Yamaha Bolt R-SPEC, and 805cc Suzuki Boulevard M50 all dyno between 43 and 49hp at the rear wheel in stock trim. I agree. Moto Guzzi enthusiasts will tell you “it’s not about the power” but slothful bikes aren’t very fun. Power (comparable to other bikes of similar displacement) wouldn’t hurt this bike one bit. I’m sure that’s a very true statement or Guzzi enthusiasts wouldn’t be. I view it more as to each their own. It’s not ignoring a lack of brutal top end horsepower but being at a point where a particular model does what they want. When I took a Norge out for the first time, test drives were available, I found overall power more than sufficient in today’s traffic and found the engine’s characteristics reminiscent of an era gone by. It had a comfy seat, smooth going down the highway and great pull down low. I also wanted something I didn’t see coming and going around me. I’ve been very happy, no issues other than lean mapping off idle and as easy to service as a lawnmower. Not everyone’s cup o’ tea, but for me that’s part of what I like about it. No offense, but I’ve never understood the “I also wanted something I didn’t see coming and going around me” statement. I mean who cares what everyone else is riding. Now my younger brother would buy something for that reason (and he did a T120 Bonnie that everyone walks up to him and gushes over), but he likes the attention. I’ve always bought the bike that suited me best regardless if it was wildly popular with others or not. I don’t care if anyone talks to me about my bike when I stop at a gas station or restaurant. Didn’t buy it for them, bought it for me. No offense taken. I’ve certainly had much more popular models through the years, didn’t bother me but when I bought the Norge it just struck me as unique. I don’t mind a little attention but I don’t think I generally seek it out. I like diversity, is more who I am. There are many good products out there and do pride myself on doing my homework. I like healthy choice as a consumer and I don’t mind straying from any growing trends when another product fills the bill. Now, having said all that, I don’t see myself as ever wanting a Harley no matter how good they are in some people’s eyes. Too common, I mean that’s almost all you see some days, too much of a cliche’ in my mind and that’s what many buy them for. Too many other good bikes out there. Hey, that’s me. Like the Harley riders who claim to be loners, they always take nick names like Lone Wolf, and then all they do is go on poker runs, and rides with 200 people just like them. If Harley made a great standard or sport tourer I would buy one, but fat chance of that happening. If Harley did I’d certainly have me a look and mostly probably because it would break the mold. I’m sure they’re most capable of producing anything they wanted, if they wanted? Displacement? Are you planning on racing this in some class that has displacement limits? Because displacement is completely irrelevant for a street bike. What matters more is the area under the torque curve and the bike’s weight. If you can’t ride a this 439 pound (wet) bike fast, it’s you, not the bike. Does this passenger seat make my wife look FAT? Rather looks like a roamer, a cruiser but sportier.